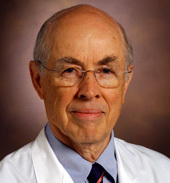 John Oates, M.D., a pioneering clinical pharmacologist at Vanderbilt University Medical Center (VUMC), has been awarded a one-year, $20,000 grant from the Brain Aneurysm Foundation to support studies of the stroke-reducing potential of acetaminophen. Oates is the Thomas F. Frist Sr. Professor of Medicine, professor of Pharmacology and founding director of the Division of Clinical Pharmacology. He is one of 14 researchers in the United States and Canada to receive grants this year from the Massachusetts-based foundation. The awards will be presented Sept. 28 in Durham, North Carolina. “These gifts are essential to our mission, as only through research can we improve outcomes for the thousands of people with brain aneurysms,” Christine Buckley, the foundation’s executive director, said in a prepared statement. Brain aneurysms are weak bulging spots in brain artery walls. Every year about 30,000 Americans experience a brain aneurysm rupture, which causes bleeding on to the surface of the brain. About 40 percent of brain aneurysm ruptures are fatal, according to the foundation. Two thirds of survivors suffer permanent neurological damage. Oates and colleagues discovered the mechanism whereby acetaminophen reduces pain and relieved fever by blocking synthesis of pro-inflammatory molecules called prostaglandins. Based on this understanding of the molecular mechanism for acetaminophen’s action, they found that it also can prevent formation of a potent vasoconstrictor found in subarachnoid hemorrhage. They now are investigating whether the drug can prevent one of the most lethal consequences of rupture — cerebral vasospasm (constriction of the arteries that supply the brain).